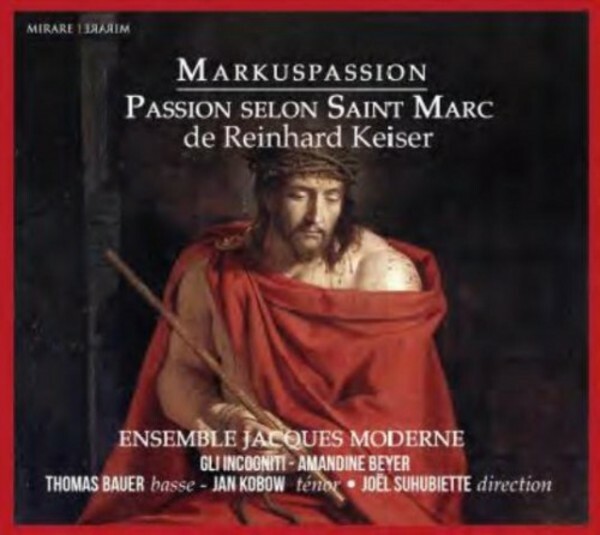 Recent musicological research tends to suggest that the 'Markuspassion' is not the work of Reinhard Keiser, essentially for stylistic reasons. However, it has not yet proved possible to attribute it positively to any other contemporary composer, such as Nicolaus Bruhns, or to Gottfried Keiser, Reinhard�s father, and so its paternity is currently uncertain. The St Mark Passion, which probably originated in the first decade of the 18th century, occupies a prominent place in Bach�s music library as the only music for Passion by another composer which he performed several times. For the young Bach in Weimar, this St Mark Passion was a didactic piece for learning the art of the modern narrative recitative: as the Leipzig Thomaskantor he also performed it in 1726. The present recording uses Hans Bergmann�s edition, published by Carus-Verlag, which is based in essence on the version performed in Weimar in 1713. Although no one is absolutely sure of the forces employed on that occasion (which must have been, at the minimum, four singers, four strings and a harpsichord), Mirare have decided to assign the four voices of the chorus to three singers per part, with the soloists also taking part in the chorus, except for Jesus and the Evangelist. The two violins and two violas are joined by a continuo group consisting of organ, harpsichord, cello, violone, theorbo and bassoon. This project arose from the affinities of Jo�l Suhubiette and Amandine Beyer with this repertory, but it is also an expression of friendship between two ensembles, Jacques Moderne and Gli Incogniti, which came together to recreate this very special work.